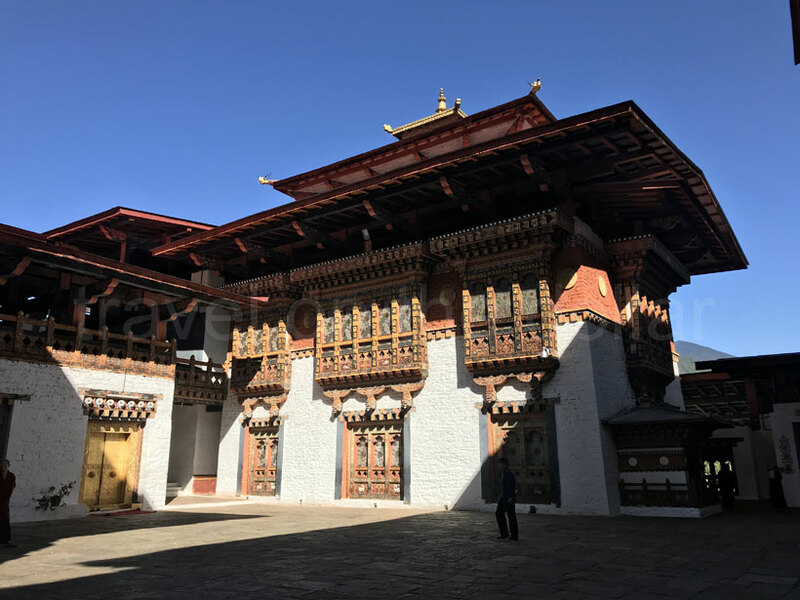 Waking up this morning, I had late breakfast at the hotel I was staying at and that’s when I was told that Punakha Dzong closes between 12pm to 3pm on any day. So I headed out to see this beauty right after breakfast. 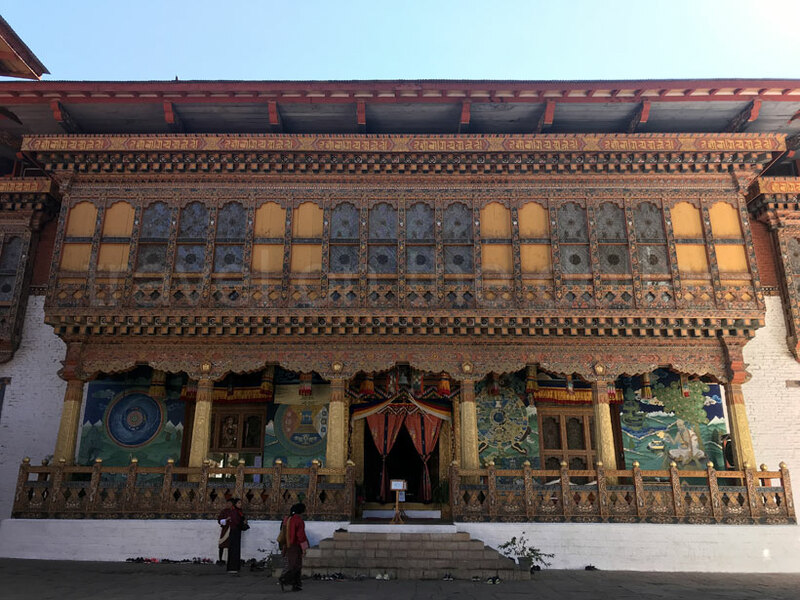 Walk up to the taxi stand in Khuruthang and you will find a lot of taxi drivers going to Punakha Dzong. All these are shared taxis and costs BTN 40 one-way, per person. All taxi drivers park on the Khuruthang-side of the river and you can just cross the bridge to access the Dzong. Return taxi drivers are available until 9:30pm and costs the same amount of BTN 40 per person. 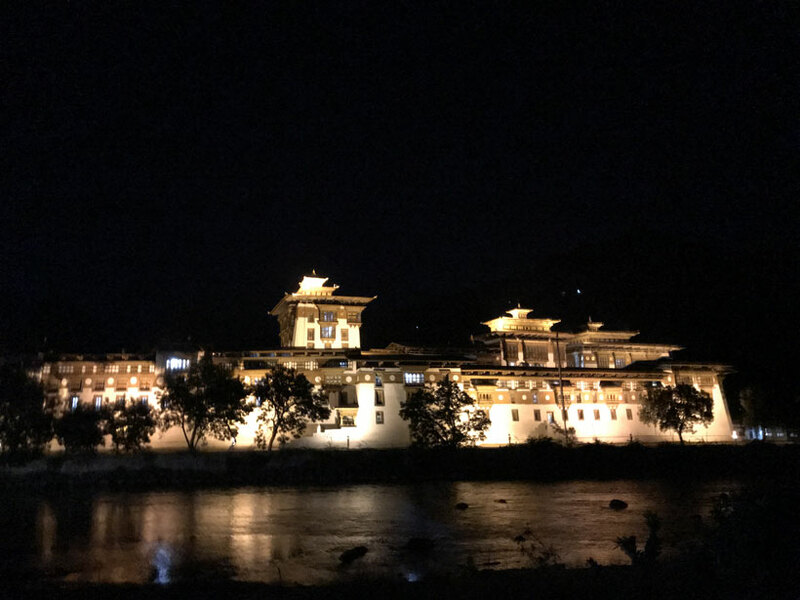 Punakha Dzong is undoubtedly the most beautiful and charming Dzong in Bhutan, standing tall right at the confluence of two rivers Pho Chhu (Father River) and Mo Chhu (Mother River). 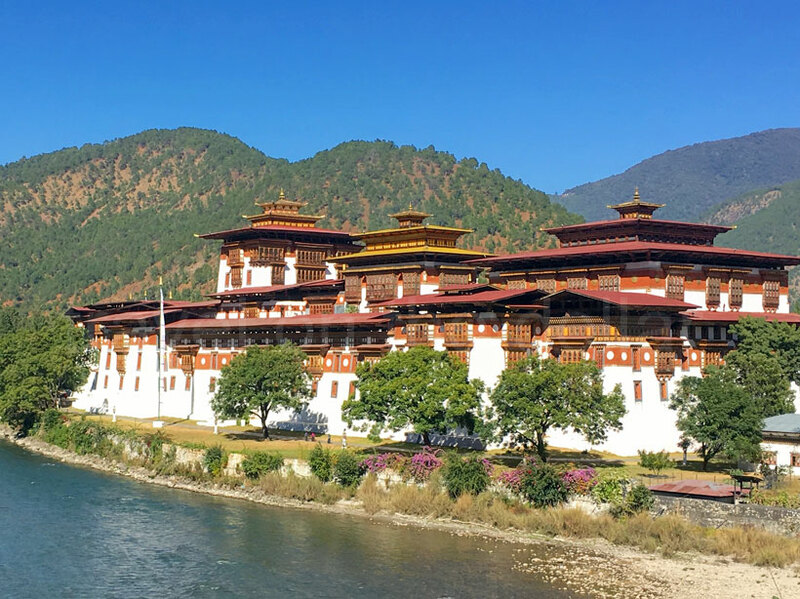 Punakha also served as Bhutan’s capital before the honor was transferred to Thimphu in 1950s. 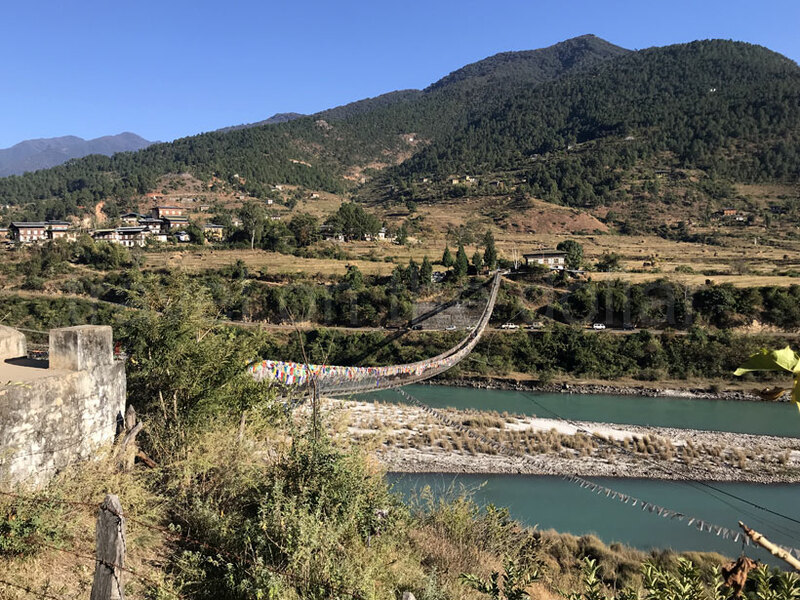 To reach the Dzong, you have to cross a spectacular wooden bridge. Tourists are required to pay BTN 300 as entrance fees at the ticket counter as soon as you enter the bridge. Non-Indian/Bangladeshi/Maldives citizens are not required to purchase the ticket as this is included in the tour price. There is a temple on your left after crossing the bridge. 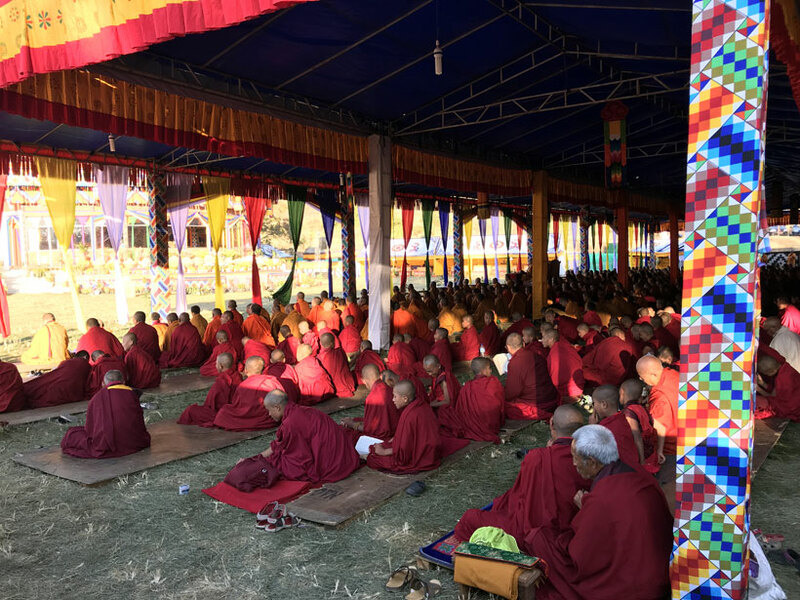 Bhutanese parents visit the temple to get blessings for their children. 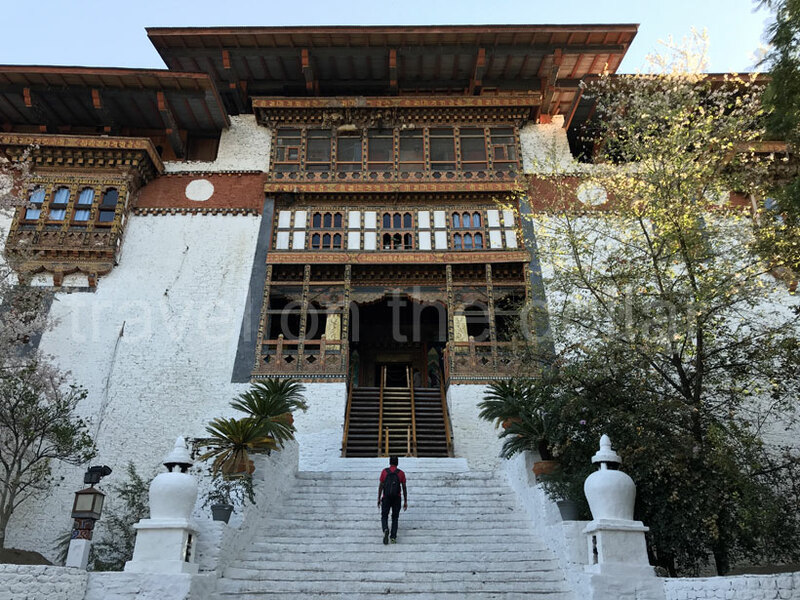 Long & steep stairs lead to the big wooden entry gate of Punakha Dzong in front of the temple. 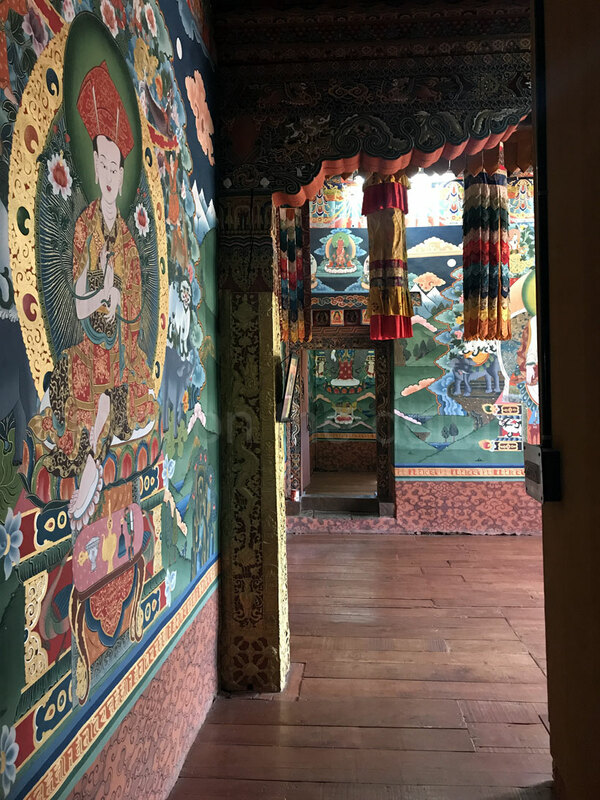 Inside of the Dzong is beautiful with a large courtyard lined with administrative buildings on 3 sides and a huge temple at the front. Wooden carving of roof and windows against huge whitewashed walls adds to the charm of this beautiful edifice. Towards the end is the ‘hundred pillar’ assembly hall temple with massive gold statues of Lord Buddha, Guru Rinpoche and Divine Madman. 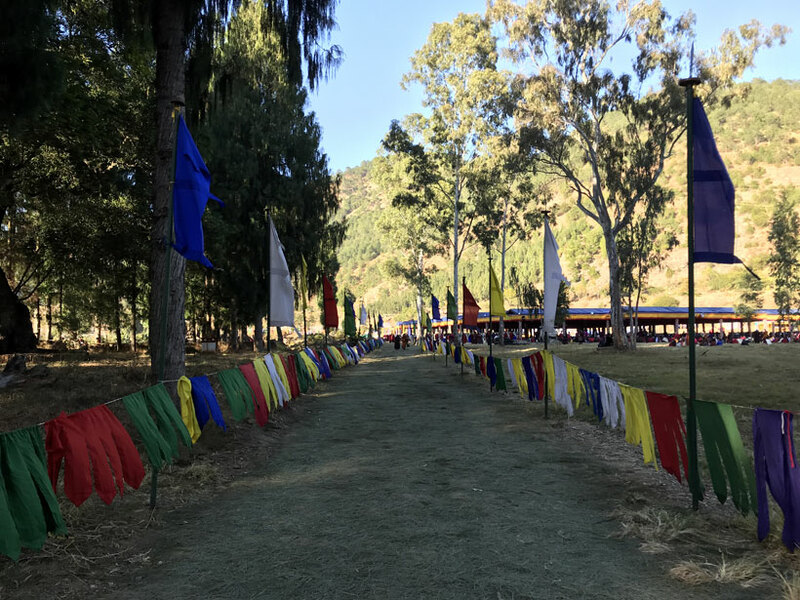 I was told by the hotel crew that there was some celebrations going on for eight days during that week, and thousands of people would be assembled at the grounds behind the Dzong. Prayers and chanting can be heard around the entire area. 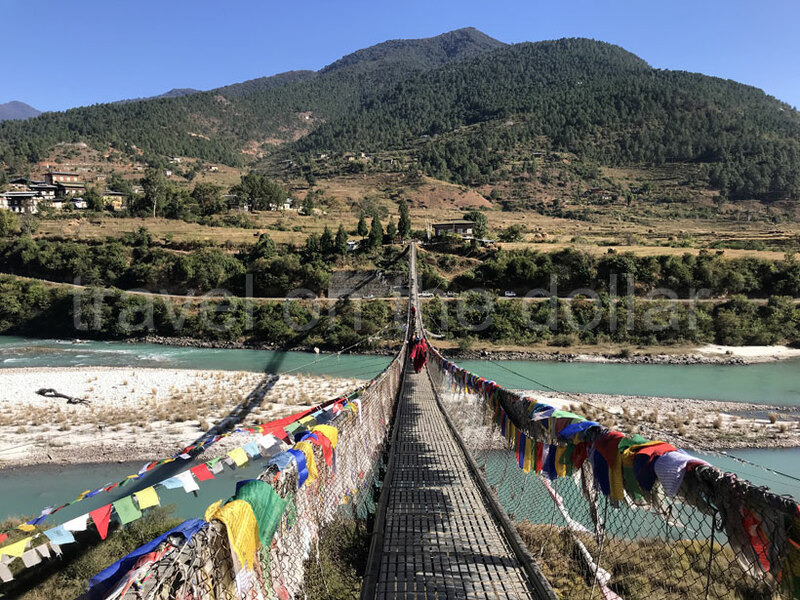 A spectacular suspension bridge lies about 15-minute walk from the Dzong. 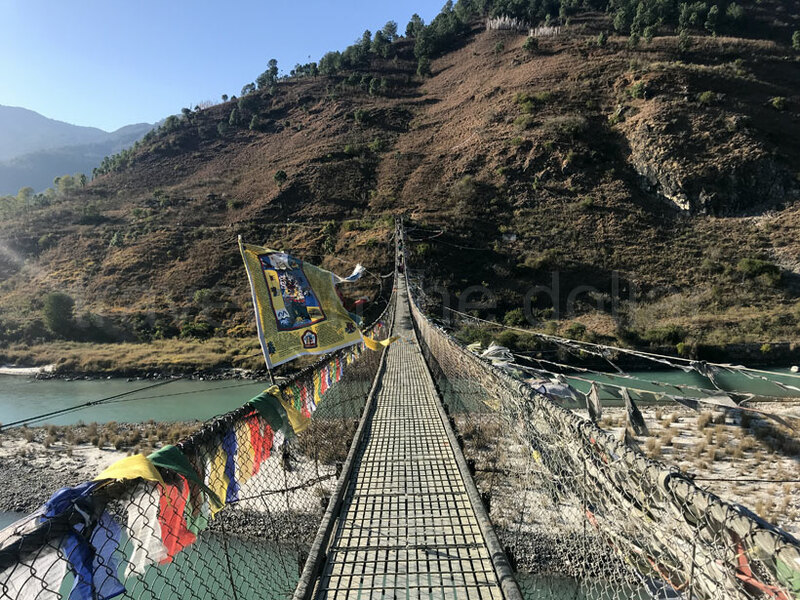 Take an exit from the back gate of the Dzong and walk straight till you get a mud road that leads to this beautiful suspension bridge. 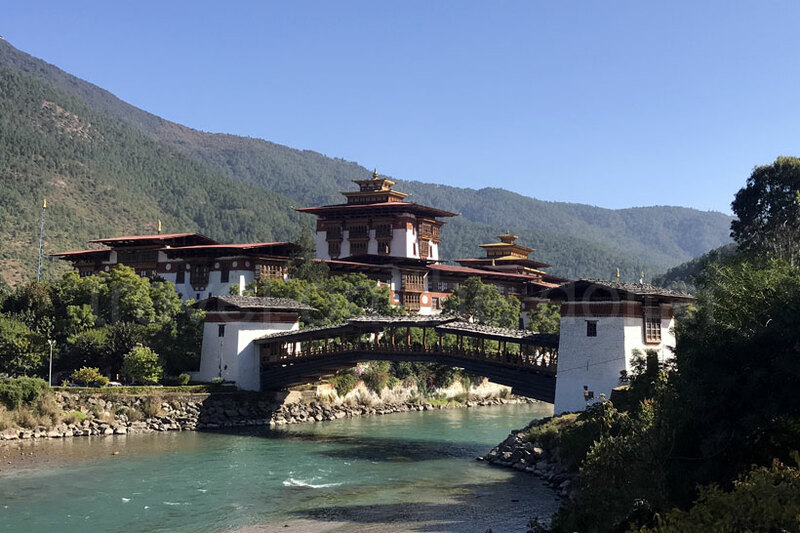 But I was asked to leave the Dzong at noon since they close down for three hours, so the only way to reach the bridge was to have a long detour (~ 30 minutes). I walked straight ahead on the road parallel to river till I reached an iron bridge. 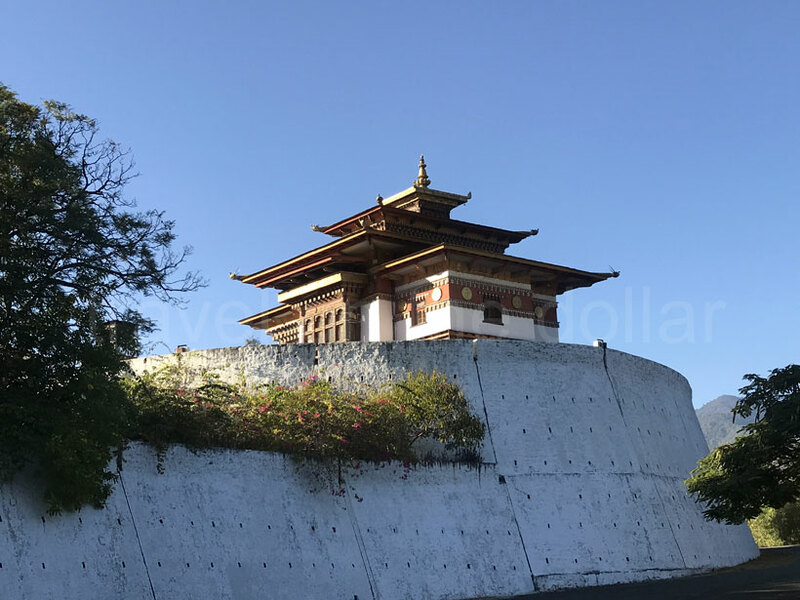 After crossing the bridge, I walked on the road to reach the backyard of the Dzong and from there, another 5 minute walk to reach the suspension bridge. 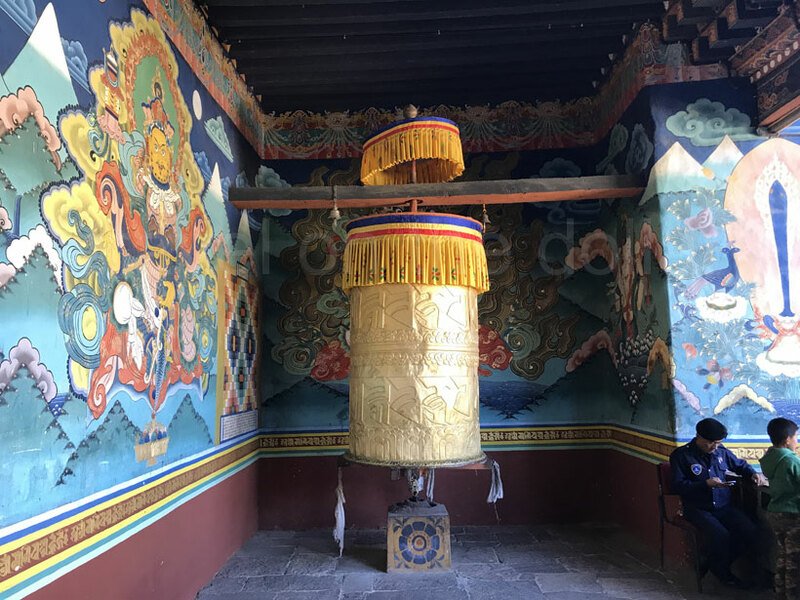 It was almost 4pm by the time I walked back to the Dzong. And right next to the parking area outside the Dzong, there’s a local market where farmers come to sell vegetables and fruits. Along with the sellers, some tiny ‘restaurants’ offer snacks, tea and coffee. 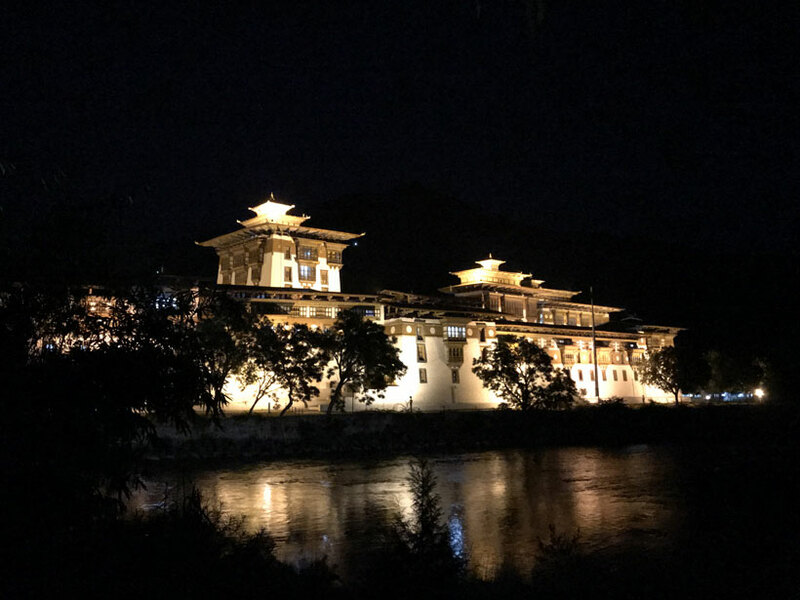 I wanted to see Punakha Dzong in night when its lit up. So I stayed at one of the ‘restaurants’ for snacks and coffee, until it was 6pm when they turn on the lights. I took the taxi back to Khuruthang and after dinner at a local restaurant, I called it a night! There are not many restaurants in the small Khuruthang, but this one place, with no name, is located right next to ‘Yak Herder Camp’. Brunch $1.34 BTN 95 at local restaurant. Taxi $0.56 BTN 40 one-way from Khuruthang to Punakha Dzong. Taxi $0.56 BTN 40 one-way from Punakha Dzong to Khuruthang. 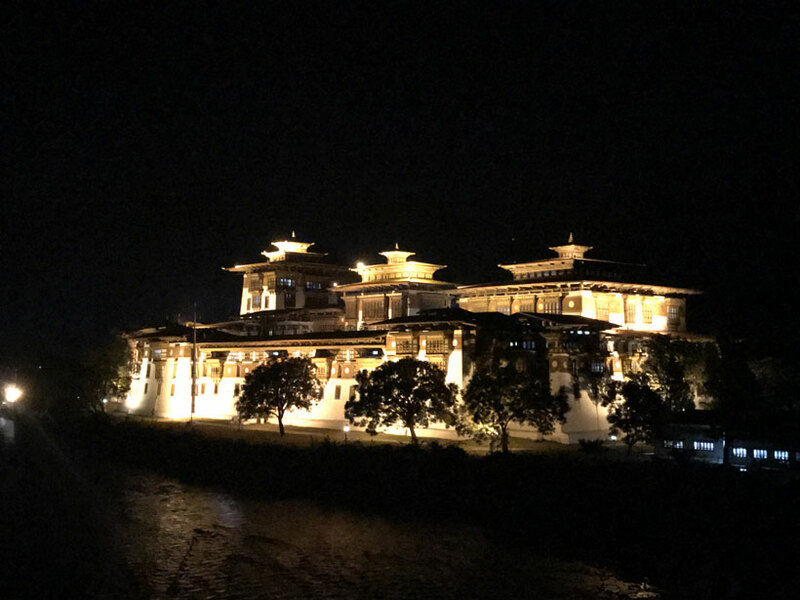 Punakha Dzong $4.22 BTN 300 entrance fee. Snacks $2.25 BTN 160 for coffee, juice & snacks. Dinner $2.25 BTN 160 at local restaurant opposite Yak Herder Camp.